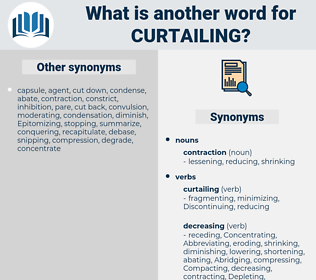 What is another word for Curtailing? 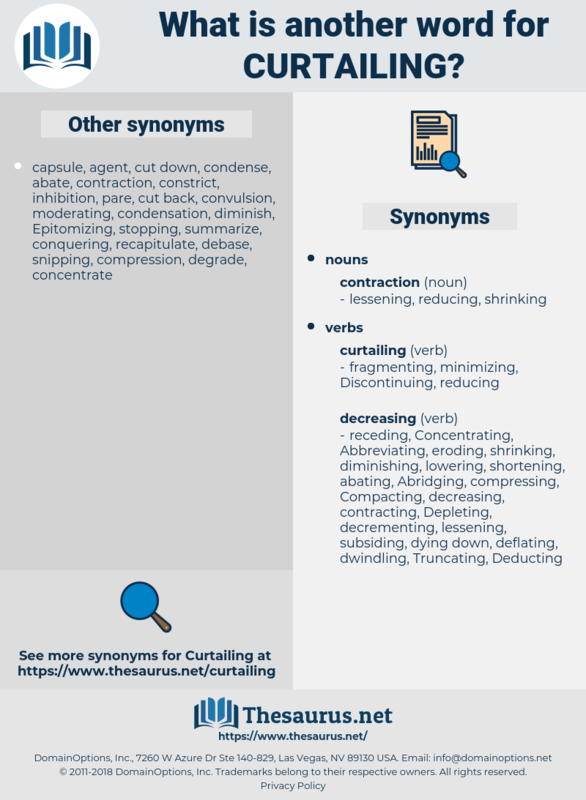 Eradicating, Eliminating, discouraging, Alleviating, limiting, constraining, Mitigating, Disrupting, Counteracting, Obstructing, Precluding, thwarting, stifling, de-escalating, Hampering, impeding, halting, Impairing, stopping, Suppressing, Relieving, averting, Interrupting, undermining, hindering, decreasing, minimising, Deterring, Detracting, interfering, Diluting, inhibiting, Endangering, Jeopardizing, affecting, tackling, Depriving, Preventing, Truncating, confining, countering, Halving, jeopardising, Reining, Allaying, Impacting, disappearing, lower, lowering, weakening, Prescribing, dampening, scaling, Divesting, blocking, Depleting, slashing, Prejudicing, Combating, combatting, moderating, Sacrificing, trimming, Checking, fighting, Containing, Reversing, dwindling, arresting, Obligating, declining, Harming, abating, defusing, eroding, offloading, cutting, slowing, qualifying, Plaguing, easing, sparing, waning, control, controlling, delimiting, straining, stripping, upsetting, Earmarking, redressing, Denying, Stemming, throttling, Capping, Committing, subsiding, Forfeiting, Anchoring, Levelling, speeding, braking, Bridging, breaking, Risking, Collapsing, Phasing, engaging, compromising, Cropping, stunting, dropping, falling, bounding, limitations. That same afternoon Fred told his uncle that he was going back to Ireland on the day but one following, thus curtailing his promised three weeks by two days. This practice of curtailing loans when reserves were depleted was demoralizing to business, since the disappointed customer might find his entire business blocked, and this in turn would inconvenience or seriously injure all those who were connected with him in a business way.